Squirrels aren’t the most common culprit to infest your home, but they can cause a significant amount of damage if they do. 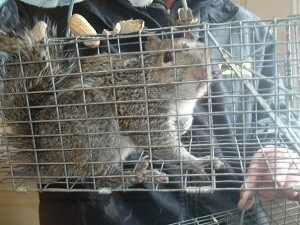 Critter Control® of Dallas has helped customers in the DFW area for 15 years with inspections and squirrel trapping, ridding their property of these potentially pesky critters. Squirrels can pose a bevy of hazards to your household, including health risks from their droppings sitting in poorly ventilated areas, and the risk fire hazards mounting from chewed electrical wires near flammable insulation and dry wood. As many Dallas homeowners have found out through attempting and failing to trap and remove squirrels from their home themselves, squirrel trapping is a job best left to a professional like the ones at Critter Control® Dallas. During an inspection, our expert pest control technicians can locate all areas of your home where squirrels have made their home, and where they got in in the first place, ensuring that all entry points are sealed. To reclaim your home today, call us for a free consultation at 817-222-1101.